Heinrich Friedrich Emil Lenz was born on February 12, 1804 in Dorpat in the Russian Empire, which is now Tartu, Estonia. 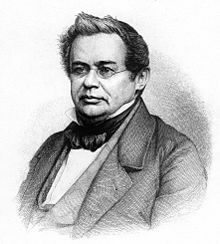 He studied theology at the University of Dorpat from 1820 to 1823, but switched to physics. After graduation he served as a scientist with navigator Otto von Kotzebue's third circumnavigation of the world, from 1923 to 1926, where he studied climate and took salinity and specific gravity measurements of sea water. He published several papers based on this trip, and in 1832 published his first paper on electromagnetism. From 1840 to 1863 he was dean of physics at the University of St. Petersburg and he served as rector there from 1863 until his death. Lenz is most remembered for his studies of electromagnetism. At the beginning of the nineteenth century scientists were beginning to understand electricity and magnetism, but did not understand the relationships between the two. Lenz took one of the first steps in filling in that gap by formulating Lenz's Law. Repeating the work of James Faraday, Lenz observed that when a electrical current is generated by a changing magnetic field, the magnetic field generated by that electrical current opposes the magnetic field that generated the current (see here for a graphic demonstration of this). This result is due to the law of conservation of energy. Lenz's results were copiously documented so that they could be easily repeated and his quantitative results were more thorough than the qualitative work that had been done previous to him. In addition to Lenz's Law, Lenz also independently discovered Joule's Law and worked on developing electroplating. Lenz is honored by the use of the letter L to represent capacitance in physics equations. Lenz died on February 10, 1865, in Rome, after suffering a stroke.